Peter and Maria Hoey are among the very best illustrators in comics. Using an ultra-precise, colorful style in the vein of Chris Ware, they love to use fractured panels to form visual gestalts along with the influence of an early 20th century aesthetic in much the same way that Kim Deitch does. At other points, they do a more straight-up kind of naturalistic illustration. Cities and music are two crucial touchstones in most of their work. In addition to their anthology Coin-Op, they occasionally produce stand-alone works that have the same dimensions and are designed to look like 45 RPM records. Blacktop Mourning (They Died By Night) is a straight illustration job, bringing to life a number of musicians whose lives were ended by car crashes. They range from blues singer Bessie Smith to early rocker Eddie Cochran to Minutemen frontman D.Boon. The Hoeys include the particulars of the accident: who was driving, what the cars hit, what the weather was like, etc. in an effort to link each of the accidents and their senselessness. It's all drawn in a naturalistic, if somber and muted, style. You Don't Look Like (Anyone I Know) is a compelling narrative that transposes the flow of crowds in a city over the buildings themselves, creating an almost ghostly image as the people the unnamed narrator is following pop into view and then pop out as the narrator shifts from one direction to another. Following a final man up to the roof of a tall building, the title phrase is uttered by the man to his pursuer just as he was about to jump off the roof, implying perhaps that the pursuer was Death. The blue tones in the comic reflect that sense of melancholy. The final stand-alone, Boxed In, was written by Adam McGovern. It juxtaposes images of vacations and other activities with the reality of the stultifying nature of urban conformity, all with a fuzzy peach veneer. It's about how those that are privileged, even if it's the bland privilege of the bourgeoisie, are dissuaded from thinking of the misfortunes of the abjected. 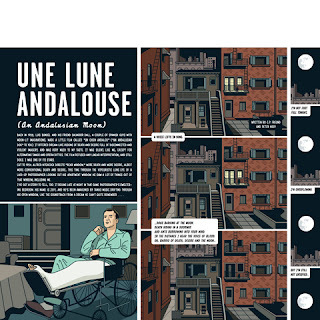 In Coin-Op #5, the story "Au Privave" sees the Hoeys use a nine panel grid to break up the larger image on the page. 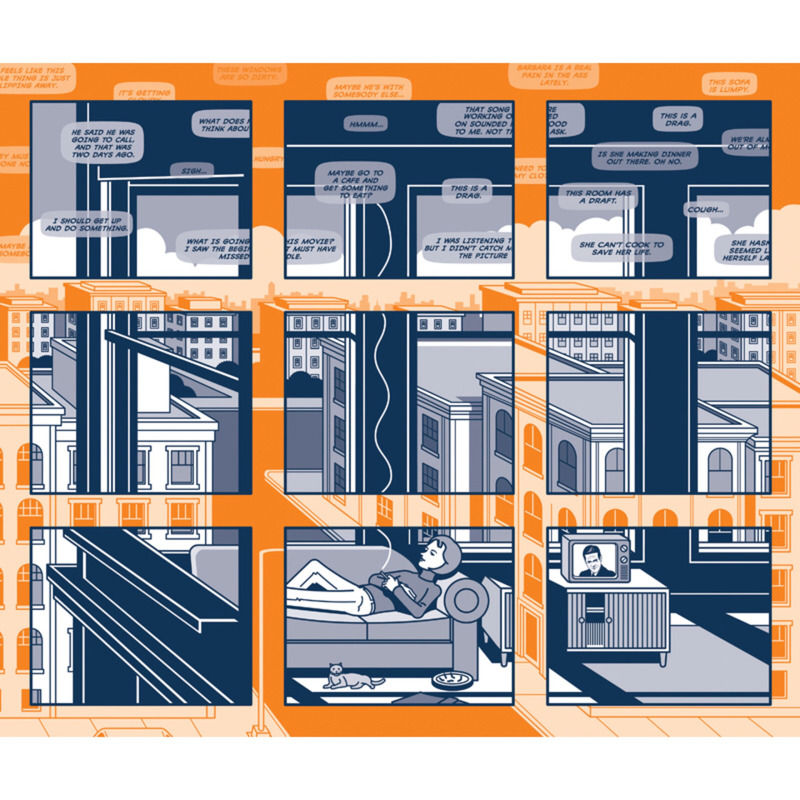 Each of the panels has a blue wash, while the extended gutter space is a bright orange while featuring drawings that complete the main image. Each column of panels on the first page features a single character, and the top panels have a variety of thoughts streaming through each of their minds. On the second page, we see a character stretched out on a couch, and her dialogue spreads across the page. The story is about jazz musicians and the wife and daughter of one of them in particular thinking about their lives. The title is a play on the title of a famous Charlie Parker song as well as the fact that these are private, inner thoughts. This issue's "Saltz and Pepz" strip (a regular feature in the anthology that's a throwback to 1920s cartooning shenanigans) is done in the orange and blue that marks the rest of the book, with an overlay of zip-a-tone that adds texture and depth. That's important for the story, especially considering the silliness of its protagonists, two dog-looking creatures that walk upright and have a cartoony design. "The Trials Of Orson Welles", written by Peter Hoey and C.P. Freund, is my favorite story in the issue. The Hoeys have always shown a fascination with classic cinema, and this story manages to blur and warp several of the great director Welles' best films. The bottom row of panels that run across each page are done in the style of an old newsreel, with a mixture of oblique commentary and explicit credits regarding which Wells character is being introduced in the story. It begins with Harry Lime and a nod to the sewer chase scene in The Third Man, who is found by the corrupt cop Hank Quindlan from Touch of Evil. They meet with the sailor Michael O'Hara from Lady From Shanghai, who takes them to the famous funhouse from that film's climax, where they are confronted by Charles Foster Kane (from Citizen Kane, of course). The final dialogue of the fortune teller quotes Touch of Evil, asking what one could say about Quindlan: "A man? They were some kind of a man. What does it matter what you say about people?" That's a clever ending, given that the comic is an oblique commentary on Welles's use of imagery and his relationships, but in the end, it doesn't really matter what Hoey and Freund say about him. "The Windy Parade" features a series of 4 x 3 grids, each panel of which makes up a larger image and also serves as not only a discrete image, but also serves as part of a distinctly different narrative. 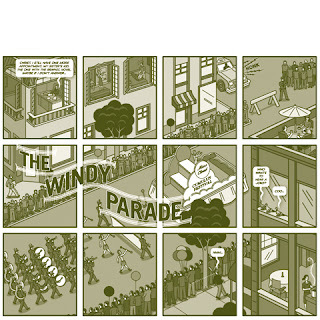 Panel one is about an editor dealing with his nephew's graphic novel, panel two features an arguing couple, and the middle panels feature a parade. Over the span of six pages, we get a satisfying little story from each set of panels, some of which spill over into other panels. It's whimsical but intricate storytelling at its best. I was less taken by "The Interoffice Memo", which uses the familiar trope of an office setting being transformed into something else. Here, it's an elevator leading to an island across an expanse of water and the systems admin office, and then back to the original desk. The mixture of mundane and surreal feels a bit forced. 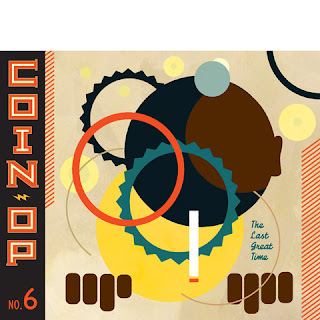 In Coin-Op #6, "Inter-Office Memo" continues with an even more opaque approach to storytelling. Mixing together the image of the office being flooded and a worker surviving a boat on the river crashing into the shore, the clutter of the storytelling technique didn't justify the end result. On the other hand, I appreciated that this installment of Saltz and Pepz was a take on Waiting for Godot, as the two were pushing a handcar along a loop on a video cassette tape, never making progress and constantly commenting on their predicament. With canary yellow in the gutters adding a sort of muting process to the actual art, the overall flatness of the strip and its repetitive structure doubles down on its theme without wearing out its welcome. "Une Lune Andalouse" may be the Hoey's greatest achievement: a mash-up of Luis Bunuel and Salvadore Dali's surrealist classic Un Chien Andalou and the Alfred Hitchcock classic Rear Window. Co-written by C.P. Freund, the genius of this story is that it combines the suspense thriller elements of Rear Window and merges them with the transgressive elements of Un Chien Andalou in a manner that emphasizes the films' common element of voyeurism. Raymond Burr is replaced as the villain of the piece by Bunuel himself, as the story switches between black & white and color, depending on which film it's quoting at the time. Reprising the famous razor-to-the-eyeball scene from Un Chien Andalou and making it the central point of violence and terror for the James Stewart and Grace Kelly characters generated genuine tension, especially since surrealism at its heart aims to get at what is hidden in the subconscious and bring it to light through provocative imagery. 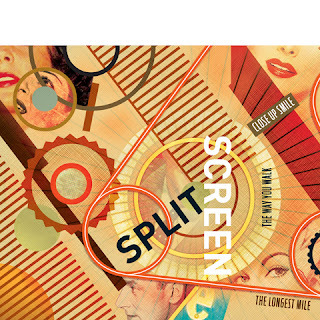 This issue also features an image-heavy piece that combines still images from film and shapes that are meant to represent a film projector rolling, which I thought was clever. There's also a longer piece about the director Nicholas Ray that's dense but entirely straightforward, mixing a first-person narrative from the director's point of view with all sorts of revealing anecdotes, along with snapshots and anecdotes from those that worked with him. That the panels form the shape of a film strip is yet another typically clever Hoey design choice. The issue also features what seem to be some illustration jobs, all of which get top-notch reproduction values here. 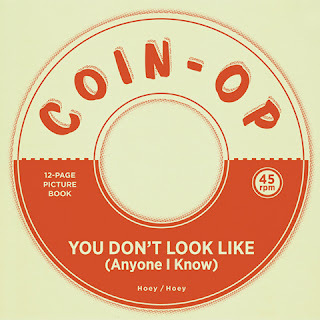 What's impressive about the Hoeys' work in Coin-Op is not their obvious skill as illustrators, but rather the way they think through every piece so carefully. Rob, just wanted to say I always enjoy your reviews. Definitely going to check out several of these mini-comics.